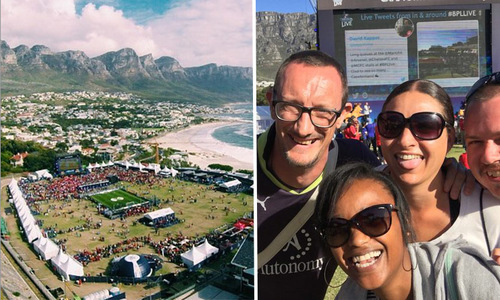 Cape Town, South Africa was host to the third staging of the football roadshow BPL Live (#BPLLive) in March 2016. The event rewarded fans with a chance to see the Barclays Premier League Trophy, meet former players and watch Premier League matches live on giant screens. Featuring two of South Africa’s greatest Premier League players, Quinton Fortune and Lucas Radebe, as well as other Premier League icons such as Peter Schmeichel, Robbie Fowler and Shaun Goater, the BPL Live event attracted thousands of fans. Twitter was sponsoring the occasion and contacted EventBeat directly to create and manage the social media wall for the entire occasion. Working alongside Wasserman, the EventBeat team built the platform which was utilised to fuel mass social media engagement, enabling the Twitter brand to become an integral part of the event. As Twitter was the primary sponsor for the large screens we needed to create a dynamic, interactive experience that would allow fans to engage with Twitter in different ways throughout BPL Live. Working within tight schedule constraints, we developed 4 interactive social media streams that fans at the event and around the world could engage with. The first stream managed a Twitter wall using EventBeat’s screen cast software, displaying the general buzz across Twitter relating to the event. Twitter requested that we introduce a new feature that allowed animated (Vine) videos to be visualised within mixed content pages. We designed a feed with this capability in mind and fans across the African continent shared vines showing off their football skills for the enjoyment of the crowd! Before the Manchester Derby and the Southampton vs Liverpool games we created a ‘battle-off’ feed between fans of each team. Tweets were monitored by the EventBeat platform administrator and broadcast live. An MC on stage in front of the big screen in Cape Town refereed the tweet battles creating an energetic atmosphere for the crowd. The live Twitter feed encouraged the audience both present and online to be active on Twitter, Vine and Periscope throughout BPL Live, giving the brand dominance over other social networks.